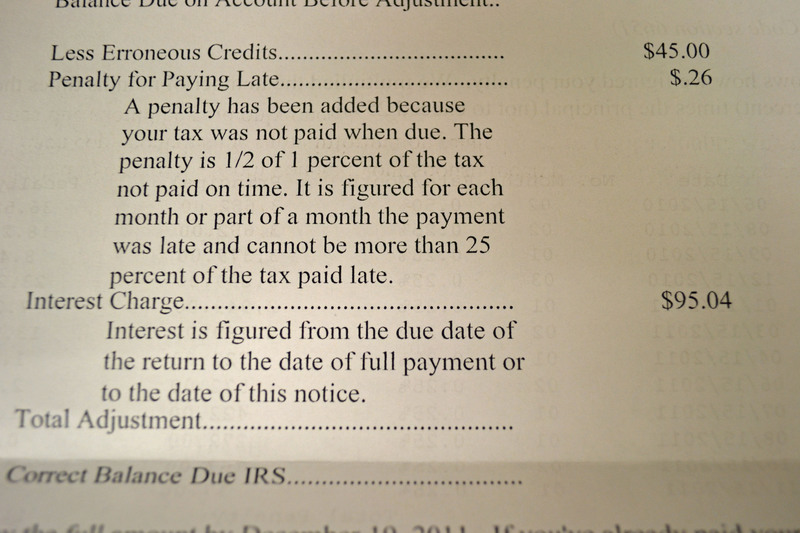 I was going through the mail yesterday and Tony and I each got a notice from the IRS. Um, never a good sign, right? So I opened it. Apparently they reviewed our 2009 return and found a credit that was erroneously applied to our account. We owe them $45. Fine. I had another hash for breakfast, this time with the leftover kielbasa from our red beans and rice from the night before – this time with egg, spinach and red pepper – my camera was fully charged too! On the side was half a banana and a few pecans. 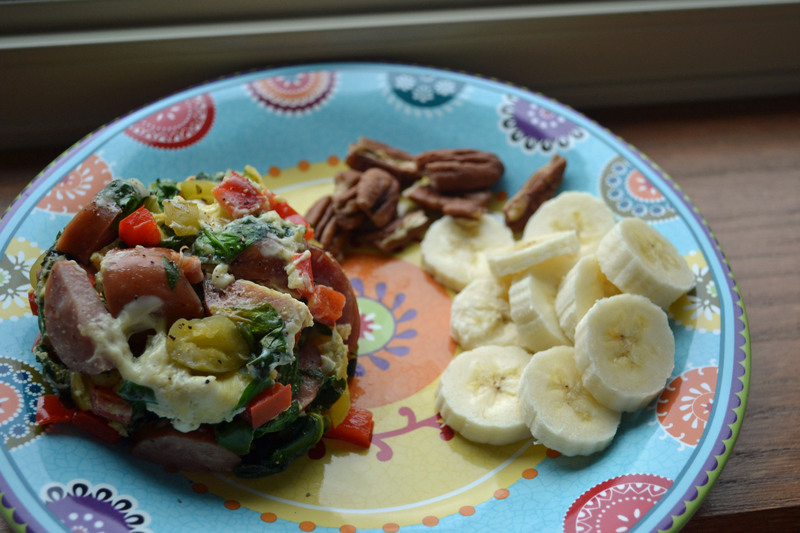 Gosh I love pecans – especially eating pecan on top of the slided banana. 😀 Breakfast comes in at 405 calories, 29 fat, 21 carbs, 4 fiber and 15 protein. I loved my work day yesterday – I had my checklist of things to accomplish, and slowly but surely crossed some of them off my list. My desk doesn’t look like a disaster anymore and I hope to catch up on my filing by the end of the week. No interruptions! 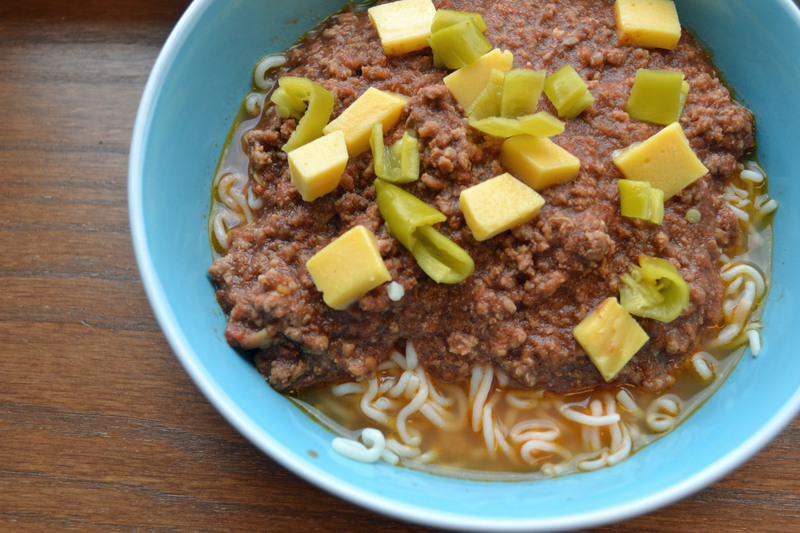 For lunch I had chili mac – I had two servings of Paleo Chili in my freezer so I brought one to be served over tofu noodles – I know, not quite Paleo but I love these things – a whole package is only 40 calories too. Some people think they stink – just rinse them well, cook them in the microwave for 1:30 seconds, then rinse them again – my lunch comes in at 388 calories, 24 fat, 15 carbs, 6.2 fiber and 27 protein. I had pork on the menu, but was wonderding what side dish I should make and remembered I had zucchini. 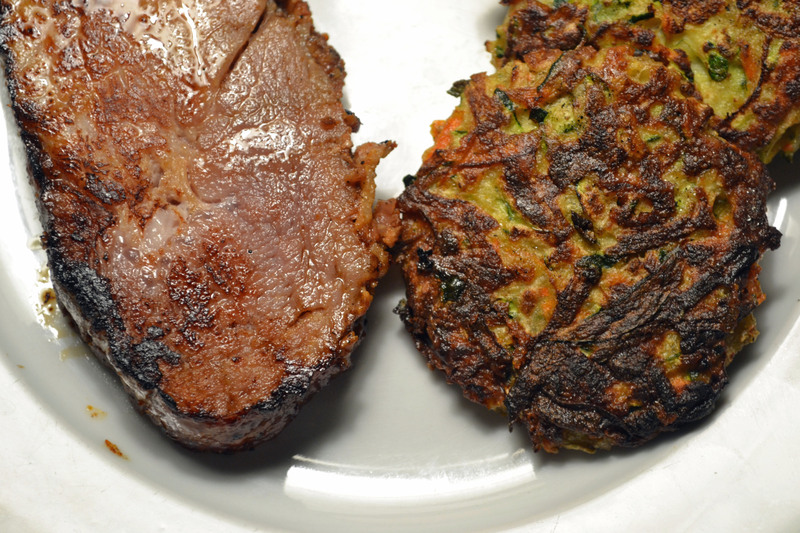 I decided to attempt another (almost) Paleo zucchini pancake as our side dish. The texture was much better! 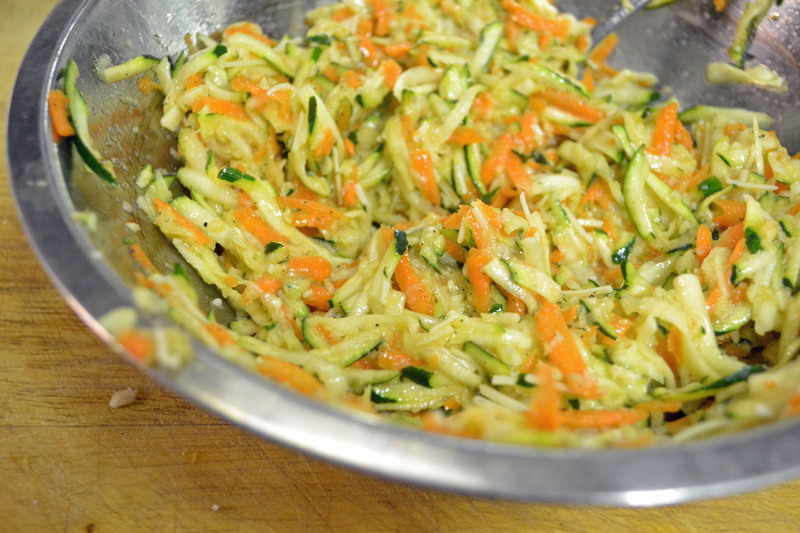 Shred the zucchini and carrots. Put in two layers of paper towel and squeeze as much moisture out as you can. Add to bowl and mix with remaining ingredients. 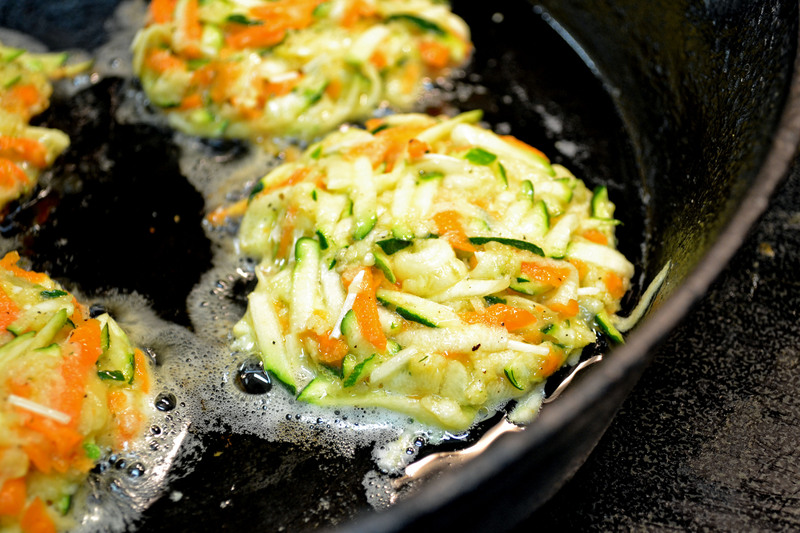 Heat 1 teaspoon oil in skillet over medium heat – cook for 2-3 minutes a side. Keep in a 225 degree oven to keep warm. 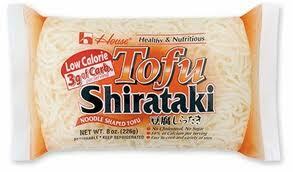 Dinner comes in at 356 calories, 7 fat, 298 carbs, 5 fiber and 47 protein.